By popular demand, here it is! 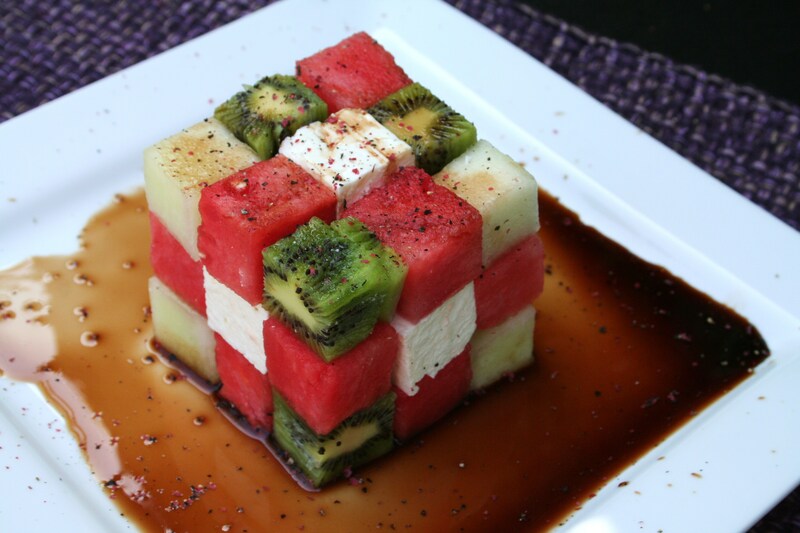 The Rubik’s Cube Salad I posted on Facebook a few days ago. Now, I fussed over whether to write a post because this little salad does not really have a “recipe” with measurements, other than the measurements I used to cut and stack the fruit and cheese. But, it is a creative way to impress dinner guests and family during the heat of summer. I made this salad with a watermelon, Galia melon, kiwis, and feta cheese. Using a ruler, I cut the fruit as close to the same size (one inch by one inch) as I possibly could. Needless to say, the kiwis were a pain in my Rubik’s Cube. The melons yielded enough fruit for me to practice on. The feta was firm, but I did not want to take any chances, so I froze it before I cubed it. That’s it! You cube fruit, and then you stack it. Big avocados and beets would work as well as any other melon. For kids a simple drizzle of honey would do as a “salad dressing.” For a more sophisticated approach, drizzle on some good balsamic dressing and top off with cracked pepper. Heck, sprinkle on some Tajin and call it a day.